Snail – it's pretty exotic to domestic latitudes product, whereas in some European countries, they are widely used with aromatic oil, herbs, white bread and hot sauce. To learn the correct way to eat snails, you need to learn the simple etiquette of their use, and at the same time to read the rules of submission of this dish. 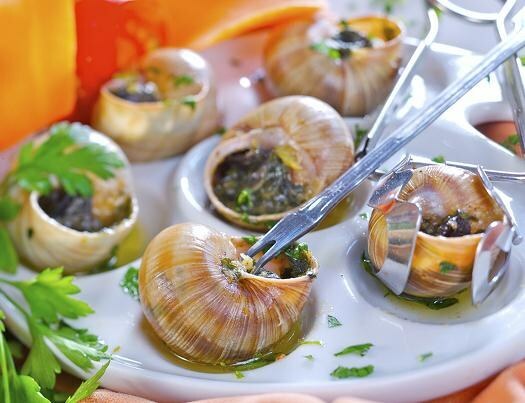 There are approximately one hundred varieties of snails are edible, but most often they can be found in Mediterranean or French regions, where lives and most edible shellfish. 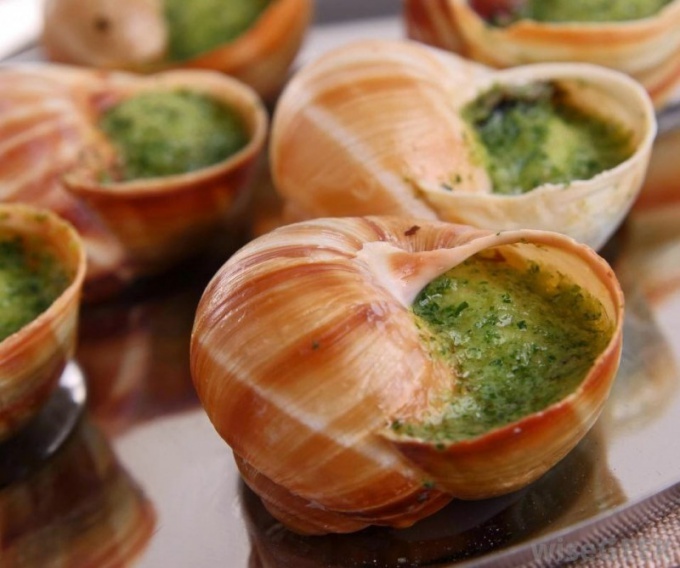 The most popular in use is the Burgundy snail, which was first eaten by the ancient Romans and Greeks. The clams with a cream or light-brown shell up to 10 inches in length and is bred not only in Europe but in the United States. The Burgundy snail is almost extinct in the wild, so the Europeans made it to the list of protected species. Culinary rival Burgundy snail is a snail Turkish – annually it imports more than 600 tons. The variety of edible snails can be found in the South of Russia, by identifying a brown shell with longitudinal stripes of cream color and 2 inches in height. However, even when these snails cannot be eaten without preparation – namely, a two-week feeding of corn flour, which derives from snails all the harmful substances. Snails are usually served baked or boiled – before cooking they are washed and then boiled in several liters of boiling water for 5 minutes. Then the meat is extracted from shells of mucus is washed in vinegar and water, again boiled with salt, pepper and herbs, after which it can be served with salads, risotto, pasta and zhuleny. When roasting snails in their shells coated with a mixture of minced garlic, shallots, parsley, lemon juice, melted butter and salt, put in the fridge for 20 minutes, and then baked. One of the most popular restaurant dishes is a tender snail meat, baked in puff pastry baskets and poured with sauce made of Parmesan, spinach and heavy cream. According to the etiquette of eating snails, they're served with special tongs (tweezers escargots) and thin narrow fork with two prongs and a long handle. Slippery and hot fix snail tongs, remove the meat from the shells with a fork and dip it in the sauce. Then a piece of meat to eat with a piece of baguette and washed down with good white wine. In the absence of escargotel tweezers can wrap the hand towel, take it the snail and gently remove the meat. If snail meat is served without the shells, it is used as a standard, using a conventional fork and table knife. Snail – almost perfect Pets. They are quiet, not shitting in the bathroom, don't rip the Wallpaper, and do not chew on the cables, do not cause allergies. Care for a snail, mi is very simple, but if you go on vacation, the snail some time to live without you. Besides, clams almost never get sick and live a long time, so you can keep the snail is a pleasure. For snails you will need an aquarium or molluscum. Aquarium size should correlate with the size of the snails, because they can be big and small. On the bottom you want to pour sand or earth. In the aquarium you need to constantly maintain humidity. About 3 times a week should be fed snails. They eat almost anything – fruits, vegetables, lettuce and cabbage, herbs, cucumbers. Many snails have their favorite product, besides which don't want to eat anything. Some snails love to eat the newspaper. For unexplained reasons they are addicted to printer's ink, but this snail can be poisoned and die. Every 2 weeks you need to clean the aquarium about once a month to change in this land. In summer, snails can walk on the grass, most importantly, to make sure that they were not biting ants. Snails – hermaphrodites. Therefore, if the aquarium will be quite warm and humid, soon snail will lay many eggs from which would hatch into baby snails. If some time do not feed and not water snail or place the aquarium in a cool place snail in a coma. They decrease in size, become more than 2 times easier due to the fact that the body goes liquid. This is useful if you are going on vacation: just put the snail in a cool place and off the road. Wake up pet easy - you pour it in, put in a warm place and give food. Snails need calcium since it is consumed in the construction of the shell. In pet stores you can buy calcium wedges intended for birds, for example parrots. For snails this calcium is also quite suitable. One beam clam will eat for about three months. Snails need water. Spray spattered the walls of the aquarium itself and the snail, she will crawl and soak up the water. To water the snails can at least every day depending on humidity. If you install the cochlea of a large aquarium and a lot of feed, the clam can grow the size of your palm. Home snail grow, trying to take all the space available to them. Home snail usually lives for about 9 years. Contain snails is quite simple – they eat everything fresh and natural products, and especially love the greens. Also, snails in large quantity need water, they need to be watered almost like flowers. Do not feed the snail food from the human table, that she might spoil the digestion. Snails feed in the evening or at night, as these animals are most active at night. If you do not change the food for the snails, but only to put a new one, they can start eating feces. It's bad, so every other day remove the remnants of the life of snails, and food that was stale and spoiled. What in any case do not feed the snail? All that preparing for the human table. Salt is very dangerous for snails, it is not all sweet, fried, spicy, smoked and marinated. Only raw and fresh food. Fruits and berries – one of the most favorite snails types of food. Anything goes: apples and pears, strawberries, blueberries, strawberries bananas, pineapples, peaches and nectarines, apricots, melons, watermelons, grapes and other fruits and berries. Fresh vegetables – food that snails often feed on in the wild. They are especially fond of cucumbers due to the large amount of liquid in them, as well as tomatoes, all kinds of cabbage, corn, pumpkins and squashes, carrots, all kinds of legumes: beans, peas, beans. Snails to maintain the desired shape of the shell requires calcium. To provide them a pet, let him ground egg shell, chalk, coquina. Very good snails fit bars calcium reassigned for parrots. One bar of the cochlea is enough for about three months. Any snail at all times of the day will be happy greenery on the table. 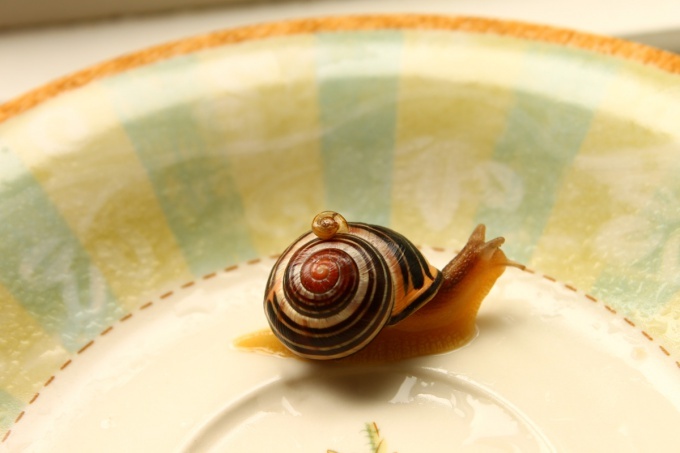 Salads and parsley, dill, celery, and spinach, and grape leaves of dandelion and plantain – all of these are favorite treats for snails. When to feed a snail and how much food to give her? This question has no definite answer. Snails, which feed a lot and often, grow quickly. They will continue to increase in size, while the aquarium will be too small, then the snail stops eating a lot. If you buy a pet a new aquarium, the snail can grow even more, it depends on the breed. Some snails up to several pounds of weight. For snails is very important water. Don't forget to update and change the water and aquarium water. You can spray the walls of the aquarium with a spray bottle is the best habitat for snails. Snails live in a wide range of ecosystems. Marshes, ditches, ponds, lakes and rivers are the perfect environment for their habitat. 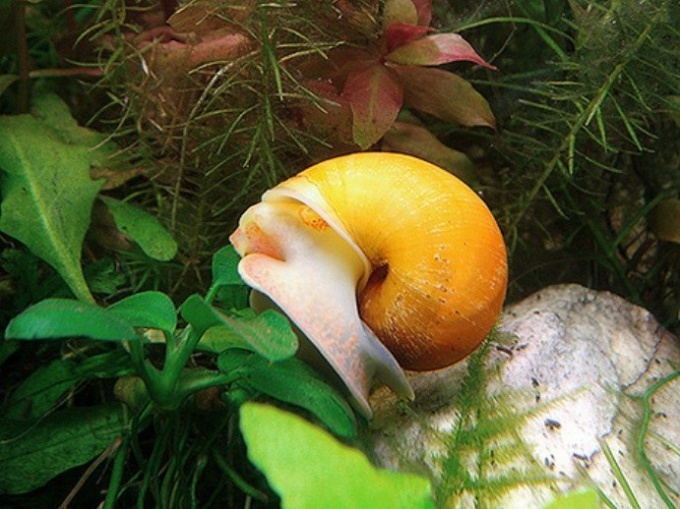 Apple snails can be kept in an ordinary aquarium with fresh water. They get along well with most aquarium fish, unless of course those do not apply to species feeding on mollusks. Aquarium snails - snails have a spiral shell and on the head of them visible sensitive tentacles. In aquariums often contain coils. Under natural conditions, snails eat mostly algae and bacterial fouling, which are formed in water. In the aquarium, these fouling have different grayish film on the glass, the leaves and the surface of the water. From the bottom of glass and plants, Apple snails are scraped algae. Sometimes they gnaw and tender young plants, but this occurs only if the snails do not have enough food. Most aquarium snails prefer to eat dead or dying plants so that the aquarium is always maintained stable water quality. Healthy plants can produce cyanides and other harmful substances that are not acceptable for many types of snails. Apple snails are eating almost anything they can tear and eat: cucumbers, spinach, carrots, fish food, dead fishes and their eggs. Since they can only eat very soft food should be fed cooked vegetables or canned spinach. Do not refuse snails and skoblenko meat and scalded lettuce. You can give them, and soaked white bread, gently tossing it into small pieces into the water. Be careful from the remnants of such food does not foul the water. Upper half of feet snails do a small funnel and tighten in her food along with a film floating on the surface of the water. After the funnel is filled nearly to the brim, clam very quickly consumes its contents. He then picks up the next batch of food. 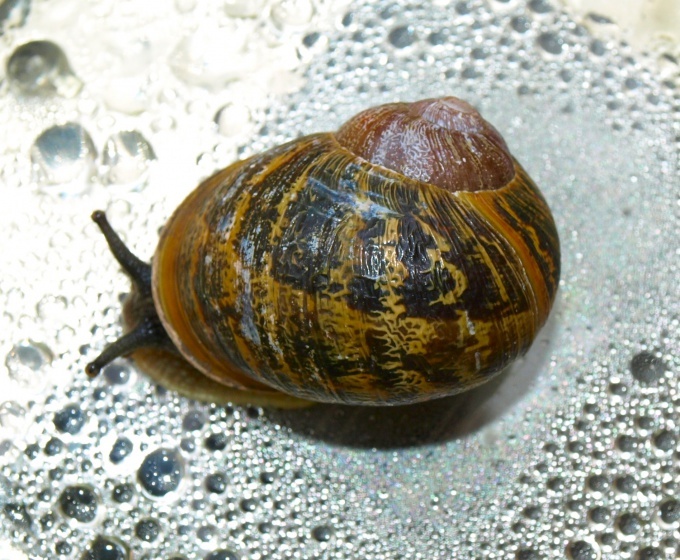 Snails need calcium for building their house, so the pH of the water should not be below 7, and it is better to make it higher, as it is very important. If the water is too soft (low in calcium), then it is necessary to add finely crushed marble, limestone, sea shells, or one of the drugs that are sold in pet stores to increase the hardness of the water. To help control the population of snails, uneaten food should be removed from the aquarium after each feeding.